Links are extremely useful for helping people to navigate your site. Links also help people to access other related websites to which you link, open a file or send an email. If you are going to have a successful website, it is vitally important that you learn how to create links. 1. In your Sitebuilder, go to Widgets. 2. From the drop-down menu, select Popular. 3. 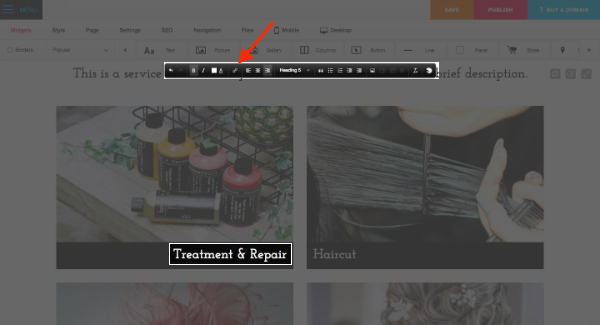 Drag and drop your Text widget onto your page. 4. In the Text widget, type in the text that you want people to click on (this is your link text). 5. Highlight the link text (in the screenshot below the words "Treatment & Repair" has been highlighted as an example). 6. Then click on the "Link" button (it's looks like a chain link). 8. 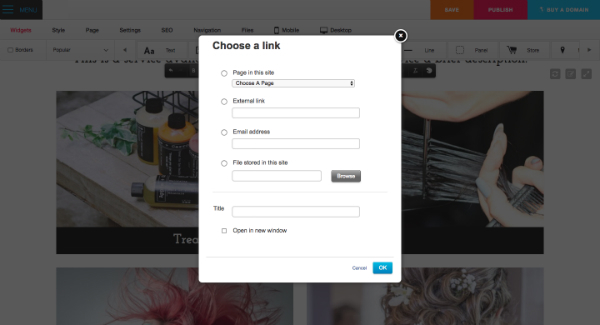 Select the External link option to add a link to another site. 9. Enter the URL of the site you want to link to. 10. Click OK and you will now have a link on your page.